Washington's unemployment rate is hovering near a 30-year-low, and the state's average wage rose 5.3 percent last year. But a closer look at the numbers shows that most jobs created amid the economic expansion in recent years don't pay very well. Almost 70 percent of the 240,000 jobs created in Washington between 2002 and 2006 paid less than $832 a week, or just over $43,000 a year — what Penn State's Poverty in America project calculates as a "living wage" for a family of two adults and two children here, The Seattle Times reported Sunday. Several of the fastest-growing job categories — retail, hospitality, agriculture and social services — have been at the lower end of the wage scale. More than 26,000 new administrative and support jobs, for example, pay an average weekly wage of $605 or $31,500 a year. General retailers added nearly 9,900 jobs that paid $460.53 a week on average, or less than $24,000 a year. So far, the current recovery generated far fewer high-paying jobs than the last boom, when businesses statewide created more than 99,000 jobs paying more than $50,000 a year — 30.6 percent of all new jobs — primarily in Internet, telecommunications and other high-technology fields. Between 2002 and 2006, just 57,000 jobs paying more than $50,000 were created in Washington, 23.7 percent of the total. Many high-paying industries have been shedding jobs during the current recovery. Statewide, the telecommunications, electronics manufacturing and air transportation sectors combined to lose more than 11,000 jobs, with an average weekly wage of $1,275.59, between 2002 and 2006. Observers have several theories about the slow growth of higher-paying jobs: the long-term move away from manufacturing toward services; higher-wage jobs being outsourced overseas; and workers in a global economy having less leverage to negotiate raises. As a rule, economists say, higher-wage jobs support lower-wage ones. But until fairly recently in the current expansion, lower-paying jobs were being created without much of an increase in higher-paying jobs. Soaring home values have kept many people afloat. Even homeowners forced to work temporary gigs after losing their jobs could still refinance their mortgages or tap into some home equity to maintain their spending levels. "The housing boom definitely brought about a different kind of growth," said Andrew Gledhill, who tracks Washington for the research firm Moody's Economy.com. "There've been few other periods in history when home values were appreciating so much and people were borrowing so aggressively on the value of their homes," Gledhill said. Until about 2005, the state's fastest-growing job categories tended to be either real-estate related (construction, mortgage banking, real-estate brokers, etc.) or in the retail and hospitality industries. As the state's economy kicked into high gear in 2005 and 2006, more higher-paying jobs have been created than earlier in the recovery. Aerospace, for example, shed 27,500 jobs between the Sept. 11 attacks and mid-2004, but has regained 17,600 since then, according to the state Employment Security Department. But many of the state's core industries — those that both employ a lot of people and pay well — have not grown at the pace seen in previous years. The last time aerospace industry went on a hiring binge, between 1996 and 1998, it added 33,100 jobs in the span of 2 1/2 years. Boeing Co., which employed 104,000 Washingtonians at the peak of the last cycle in June 1998, reported just 71,781 Washington workers at the end of July. The company has aggressively streamlined its production processes, outsourcing much work that was previously done in-house. 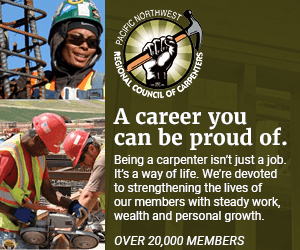 Outsourcing has acted to hold down wage levels as well as job counts, said Marilyn Watkins, policy director of the labor-backed Economic Opportunity Institute in Seattle. The software industry, which barely took a breather during the recession, isn't adding to payroll the way it once did. That sector routinely posted job growth in the double digits during the 1990s, but since the end of the recession, growth has mostly ranged from 6 percent to 7 percent. Some high-wage industries, including telecommunications and air transportation, continued shedding jobs well into the recovery, though they now seem to have bottomed out. Kriss Sjoblom, an economist at the business-oriented Washington Research Council, said the recession's heavy impact on the Puget Sound area worked to hold down wage levels statewide. Electricians and convenience-store clerks, alike, earn more in the Seattle area than elsewhere in the state. But because this region was mired in recession longer than the rest of Washington, Sjoblom said, more new jobs were created in lower-paying parts of the state. High-paying sectors are still adding jobs, but they're no longer doing so at the torrid pace of 2005 and most of 2006, said Evelina Tainer, chief economist for the state Employment Security Department. Tainer said she expects the middle tier of industries — those paying $31,000 to $48,500 a year — to lead statewide job growth for the foreseeable future.